NOTABLE CATCH:	Lots of good catches see below. NOTABLE BAG	5 fish weighing 16lb for Dennis Dooran. BEST RAINBOW:	11lb 6oz for Peter Andrews. BEST BROWN:	3lb for Mr Biscomb. BEST BLUE:	4lb 4oz for Mick Greenhalgh. BANK ROD AV:	6.72 fish per angler. BOAT ROD AV:	5.33 fish per angler. SPORT: Not a bad day weather wise with just a bit of drizzle this morning then sunshine this afternoon. Once again there were good catches recorded both from the bank and the boats. Here are the best bank catches. Dennis Doogan caught 6 quality trout today, he fished from Bells point and took all his fish on a dabbler. Mr Biscomb landed 12 fish with a mixture of browns, rainbows and blues from Hollins bay with a viva being his favoured pattern. Mick Greenhalgh was also into the fish with 9 to the net. Mick caught on a cormorant from 2 trees and next to the jetty. G Keighley landed 7 fish also next to the jetty. Brothers Ken and Mick Whiteside caught 7 fish each also next to the jetty with Mick finding lures effective and Ken on his home tied upside down fly. James Dalby and dad fished in Hollins bay and caught 9 fish between them. They caught rainbows, browns and blue trout with all their fish falling to a hot head olive damsel. Fishing from a boat today was Brian Gray who landed 8 fish. Brian caught all his fish from the northern shallows on both boobys and diawl bach. Peter Andrews had a fantastic day landing a total of 19 fish. Peter caught his fish on boobys and black buzzers and included in his catch was a giant rainbow trout that tipped the scales round to 11lb 6oz. Peter found both Hollins bay and willow island to be his best areas. Other boat anglers found the northern shallows holding fish with buzzers, diawl bach and boobys accounting for the majority of fish caught. Syotw Paul. This entry was posted in Stocks Reservoir Fishing Reports on May 30, 2013 by Ben Dobson. BANK ROD AV: 8.3 fish per angler. BOAT ROD AV: 5 fish per angler. It as been a strange old day up here today with a large part of the day from mid morning until mid afternoon becoming unsettled but staying dry, with the wind direction changing throughout which seemed to make the fishing that little bit harder. Saying that there were some great results still from both bank and boat. Here’s how it went…. Mr Baxter had 2 fish from 5pm whilst his wife walked the circular route. He caught both on pheasant tail nymphs off Bell Point, his best a 3lb 1oz rainbow. Neil Urwin had 3 fish from the bank today, his best a 3lb rainbow. Glad you had a good visit Neil see you next time! Mr Quickfall had 4 fish off Bens Beach, his 2 fish bag weighing 4lb 12oz. Mr Thornton had a belting day off the bank between Bell Point and Grange Point. He caught 11 fish in total all on hot headed damsels. His best fish was a 10lb+ blue trout. Well done Sir that is a great days fishing! Mr Lawson fished from Hollins Point today whilst his comrades took to the water on boats. He was rewarded with 14 fish in total. He was using lots of different flies and his 5 fish bag weighed 14lb..Nice work! Russ Farrand was top rod from the bank today with a staggering 20 fish in total. Russ was catching on a foam hawthorn hopper and a cats booby in and around Hollins bay. His 5 fish bag weighed 11lb 11oz. Well done there Russ good angling. Jimmy Brown was out with his Grandson Jimmy and his daughter Louise. They each had 3 fish to the boat using cats a booby and a floating line in the northern shallows. Well done kids you’ve done well to catch 3 a piece! Mr Wishart and Mr Drisedale had 5 fish to their boat up at the Dam. They were fishing using blobs. Mr McNally and Mr Gault had 7 fish to their boat. They fished in Newclose Bay and had a 3lb 12 oz blue in the mix of fish. Neil Parkinson and David Notman had 8 fish to their boat. They were fishing in the Northern Shallows and in Hollins Bay and caught on boobies and buzzers. David and Joan had 10 fish to their boat today and had their best results in Newclose Bay and near Willow Island. They were using floating lines boobies and buzzers. Well done! John Parkinson and Matt Davies had 12 fish to their boat in total. They fished the northern shallows and caught on boobies, buzzers and dries. Good variety and good result. Peter Taylor had 10 fish to his boat to the right of Gull Island. He caught 9 on a tequila foam blob and 1 on a red diawl bach. Good work Peter. Paul Bebb (aka Fly Guy) was out today with fellow angler Mike Coffin. They had 17 fish to the boat using a cats booby. They fished all over and Mike landed a belting 13lb rainbow putting him firmly in this years Doubles Club. Well done Mike and I’m glad you had a good day! This entry was posted in Stocks Reservoir Fishing Reports on May 29, 2013 by Ben Dobson. NOTABLE CATCH:	14 fish for Richard Newbolt. NOTABLE BAG	2 fish weighing 5lb for Anthony Dover. BEST BLUE:	Several weighing 3lb. BANK ROD AV:	2.50 fish per angler. BOAT ROD AV:	7.00 fish per angler. SPORT: Despite the rain this afternoon there was still some good sport to be had with the northern shallows once again the place to be. Simon Rogers followed on from his good angling yesterday by landing 11 fish from the northern shallows in a short morning session before heading off back home to Anglesey. Simon caught his fish on a floating line and cats booby and diawl bach. See you again soon Simon. Also amongst the trout today was Richard Newbolt who landed 14 fish. Richard found cats booby and yellow dancer to be his best patterns and caught from several areas including the northern shallows, Cooks creek and Blackhouse bay. Brian Gaffney and Barry Garner had some good sport landing 8 fish between them. As other anglers they fished the northern shallows and caught on diawl bach and tadpoles. From the bank Anthony Dover caught 5 fish from Grindys lawn and 2 trees with boobys and yellow lures working well for Anthony. Ben made another stocking this afternoon including some good clean brownies. See you on the water Paul. This entry was posted in Stocks Reservoir Fishing Reports on May 28, 2013 by Ben Dobson. An overcast, wet but mild day today up here at Stocks. From the bank it has been tough yet from the boat it has fished really well at the far end of the reservoir. Many thanks to the 3M Neotechnic lads for a good friendly visit to fish a small competition from the bank between themselves. Here’s the results for both the 3M lads and their guests. 1st – Ian Perry with 4 fish weighing 9lb. 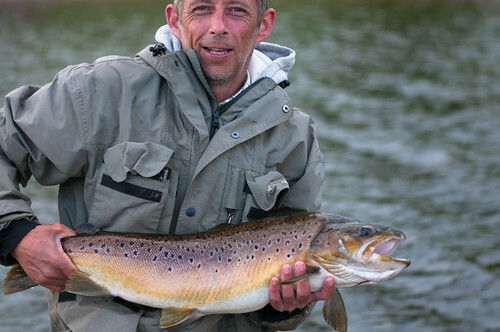 Ian caught in Newclose using nomads and brown flies fishing on a floating line. Well done Ian! 2nd – Derek Robinson with 4 fish weighing 8lb 8oz. Derek fished off Hollins point using black lures on an intermediate line. 3rd – Norman Walker with 2 fish weighing 4lb 4oz. Norman caught on damsel nymphs at Grindys/Hollins on a floating line. 4th – Andrew Childs with 2 fish weighing 4lb. 1st – Dave Hitchen with 5 fish weighing 10lb. Dave caught in Newclose using a white booby and a cats whisker on both a floating and sinking line. Congratulations Dave well done. Brian Hitchen, Peter Clough and Chris Harrison all caught fish but their bag weight was the same tying them all in 2nd place! Peter Kosminski caught 3 fish off the east bank. He caught them on a booby and said he had loads of very tentative takes. His 3 fish weighed 5lb 7oz. Nigel Blackley had 4 fish today weighing 8lb 8oz. Paul Crowther had 4 fish from Bell Point. He had 2 on a black booby and 2 on an orange booby using a sinking line. Paul Bebb and Simon Rogers were out today and had a cracking 36 fish to the boat. They were washing lining buzzers and diawl bachs in the northern shallows using floating lines. Top result chaps good work. Bernard McBride and Ryan Feber were also out today and they had 27 fish to their boat. Bernard had 9 fish using a woofter booby and dries. Well done Bernard. Ryan hammered them today catching 18 fish and all of them were on dries! Nice angling there, good result. They were fishing the northern shallows and up at the dam. This entry was posted in Stocks Reservoir Fishing Reports on May 27, 2013 by Ben Dobson. Its been another belting sunny warm day up at Stocks but it has fished hard for most anglers both bank and boat. It was most likely down to the extremely bright and breezy conditions that this was the case so I am not worried about the slight drop in fish caught. Tomorrow is meant to be overcast, mild and with some rain mid afternoon onwards.. I bet its a different story all together tomorrow…. Mick Mercer saw fish at the east bank, dam wall and hollins bay and caught 4 fish in total. He caught all of them on a yellow dancer using a floating line. Brendan Gintey also had 4 fish on a half day ticket. His method of choice was a cats whisker and he fished in hollins. His best fish was a 2lb 12oz blue. Glad you enjoyed your day Brendan, good talking with you. Gary Marshall had 5 fish today from Bell Point. Gary used a booby and had his fish in the morning. His 5 fish bag weighed 12lb. Well done. Mr T. Fryer also had 5 fish, again from Bell Point but he caught his on a sinking line with an orange fritz with a gold head. Well done there. Mr M. Bennett had 6 fish and he too was fishing from Bell Point. He caught his on a booby, his best fish was a 2lb 8z rainbow. Well done. Bell Point was the place to be today from the bank it seems. Mr M. Field and Mr A. Field had 9 fish to their boat in total but I can’t tell you what on or where from. David Maddox and Colin Stoddard had 10 fish to their boat today. They were both fishing on intermediate lines using Nomads and were fishing up to willow island. Well done lads, I am really glad you guys enjoyed your 4 days with us, we look forward to seeing you next time! Pete Langham had 5 fish to his boat today. Pete caught on a red/black blob fished on an intermediate line up near willow island. His 5 fish weighed 10lb. Mr Howes had 6 fish from the boat today. He fished up near Gull Island and near the causeway catching on a sinking line with a booby. Stuart Morgan was to rod from the boat today with 7 fish in total. He fished the northern shallows and caught all his 7 fish on black/red buzzers. Well done Stuart. So to summarise, a humble days fishing with a few well fought results across the spectrum. This entry was posted in Stocks Reservoir Fishing Reports on May 26, 2013 by Ben Dobson.